With a beautiful blue sky, a calm sea and a favourable flooding neap tide it was an ideal day for an early morning shore dive in Browns Bay. We arrived at 7:45 AM to find that numerous other North East divers had had exactly the same idea as us. Taking considerable care to cross the busy road we headed down the steep steps to the waters edge. The clarity of the water looked good with the seabed clearly visible some way out from the shore. Entering the water we headed out intending to find the wreck of the SS Butetown This steam ship was wrecked on the 14/ 12/1917 whilst carrying a cargo of coal. 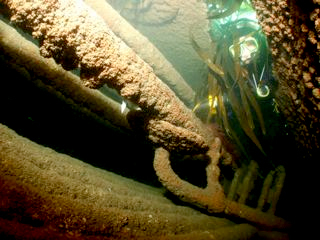 Built and launched in 1890 this 1594 ton vessel had a length of 249 m. Following her grounding on the reef the Butetown was subsequently extensively salvaged. Enough still remains of this vessel however to make it a worthwhile dive. 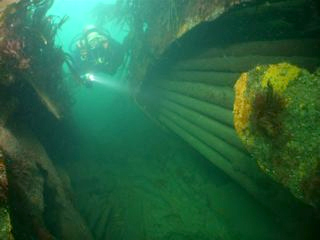 It is however quite a tricky wreck to actually find, as her remains are located behind an area of kelp covered reef and it is all too easy to simply swim past the wreck site. Despite the number of divers in the water we eventually arrived at the wreck site to find that we were on our own, with lovely clear water and no stirred up sediment! The wreck itself is very broken up but there are two reasonably sized boilers still sitting on the bottom along with the ships ribs, various pipes and other bits of rusting superstructure. After 50 minutes we headed back to the shore and clambered out of the water before making the hard hike back up the steep steps to the car. 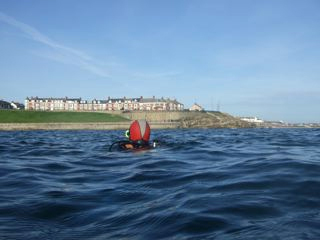 It is all too easy to forget what excellent diving is available on our own doorstep when conditions are right.